Course description: Floristry Courses - One Day Specialist Wedding Course - Vintage Wedding Venue décor. Wishing to learn how to make a vintage style top table design with a hint of nostalgia and pretty, vintage table designs to complement the vintage bridal flowers for the wedding reception venue, then this course is correct for you. The top table arrangement is the floral focal point at the reception which is why it is so important to create a stunning themed display to add that air of distinction. 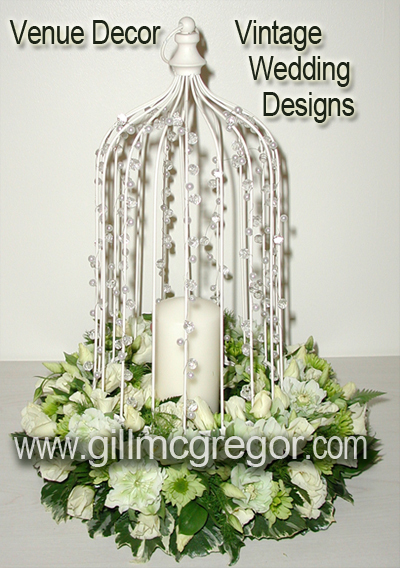 Beautiful table décor also add to the beauty and celebration at a wedding. The course will cover: the techniques required to construct a vintage style top table arrangement and guest table décor, Conditioning, packaging and storing methods, what to consider when designing table décor, costing and delivery considerations. This fun, hands on course will teach you how to create the romance of vintage for that special wedding day.